CITY OF BROOKFIELD – Veteran, doctor, proud father of two and now the 2017 Outstanding Disabled Veteran of the Year. The lifetime accomplishments of Dr. Kenneth K. Lee continue to accumulate. 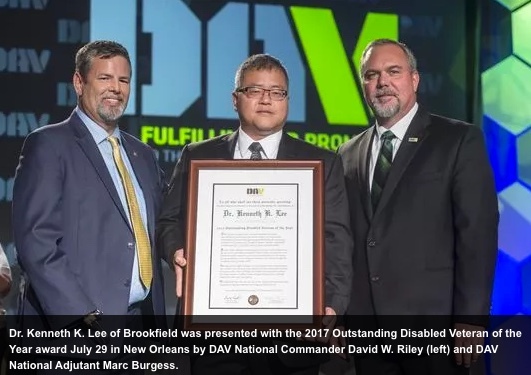 The longtime city of Brookfield resident was recognized in New Orleans by Disabled American Veterans with the award July 29. Lee, a native of South Korea, was deployed to Iraq as the commander of the Army’s Company B, 118th Area Support Medical Battalion, but was injured in 2004 by a suicide car bomber. Lee suffered an open head traumatic brain injury and severe shrapnel wounds to his legs. He was evacuated back to the U.S. and diagnosed with post-traumatic stress disorder. Prior to his deployment, Lee worked as a rehabilitation specialist at the Milwaukee VA Medical Center. Despite that experience, his own recovery was much harder than he expected. Lee, 52, credits his own patients, fellow veterans and especially his family with helping him to get through that difficult period.